A teaser photo of the right taillight section of the newest RX shows familiar sheet-metal creases but not much else other than the new "L" badging. DALLAS -- The Lexus RX with three rows of seating will be unwrapped this month at the Los Angeles auto show. 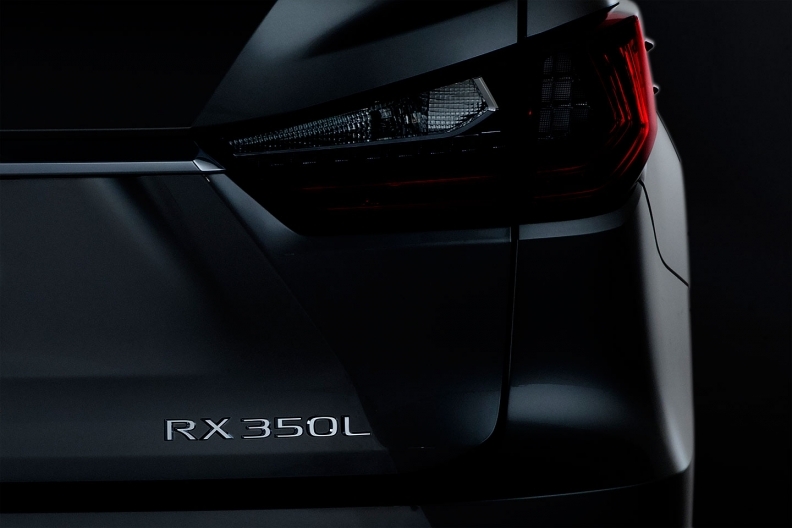 Lexus on Wednesday released a teaser photo of the three-row version of the RX. Dealers have clamored for a family-friendly version of the crossover for years. It's unclear whether the third row will accommodate two or three passengers. The 2018 RX 350L with a gasoline engine and the hybrid RX 450hL will be unveiled Nov. 29 at the auto show, the company said. The teaser photo of the right taillight section shows familiar sheet-metal creases but not much else other than the new "L" badging. Spy photos from the summer, however, suggest the vehicle will be able to accommodate the extra row with a longer rear overhang and a more upright roof, without major physical changes to the body. "The RX that paved the way for the luxury crossover segment 20 years ago will retain its stylish figure while also providing more flexibility for passengers," Lexus said in a statement. Rivals have beat Lexus to market with modern alternatives to minivans, which have lost ground in the wake of the crossover boom. U.S. sales of the RX are flat this year -- 84,254 through October -- while demand for midsize premium crossovers has increased 4.9 percent.